The fine art print is the culmination of the expressive visualization of the photographic artist. It represents the nexus of mechanical technique and the highest aesthetic and emotional aspirations experienced and communicated by the artist. Fine art printing really begins with a negative correctly exposed for the subject/scene. To paraphrase Ansel Adams' famous musical analogy - the negative is the score, the print is the performance. It will be difficult or impossible to ever work a fine print from a poorly exposed negative (in darkroom vernacular, to make it sing). If the notes are there, it will be possible to achieve your unique artistic interpretation (i.e., visualization). And for me, life is far too short to waste time beating a recalcitrant negative into submission. Making a negative will be covered in a future article. I chose the following scene because it is a recent work of an expansive landscape that requires a decent negative and entails a typical amount of manipulation to arrive at a fine print - and it is also one of my favorite places in the Sierra. A proof has already been made that suggests the likely direction of the printing session. I've chosen my favorite paper style and contrast, and decided to invest in a fine print. 11X14 sheet paper is used as the base size for the potential fine print because it is the smallest amount of real estate that I feel I am able to work artfully and effectively under the enlarger for both medium and large format negatives. Also, because of the amount of detail typically present in my negatives, it seems that a certain amount of enlargement is necessary in order that the negative can "breathe" - 16X20 mostly being the optimum enlargement. Notice that the print has been cropped from the original full frame proof. This was decided upon for both aesthetic and technical reasons. Keep in mind that the series of print scans below are actually from 8X10's, by necessity, as they are the largest scan I can manage on my flatbed Epson 4990 scanner - revisited after printing an entire series edition ranging from 11X14 to 20X24 (as is the case with all GSP's represented digitally on this site). 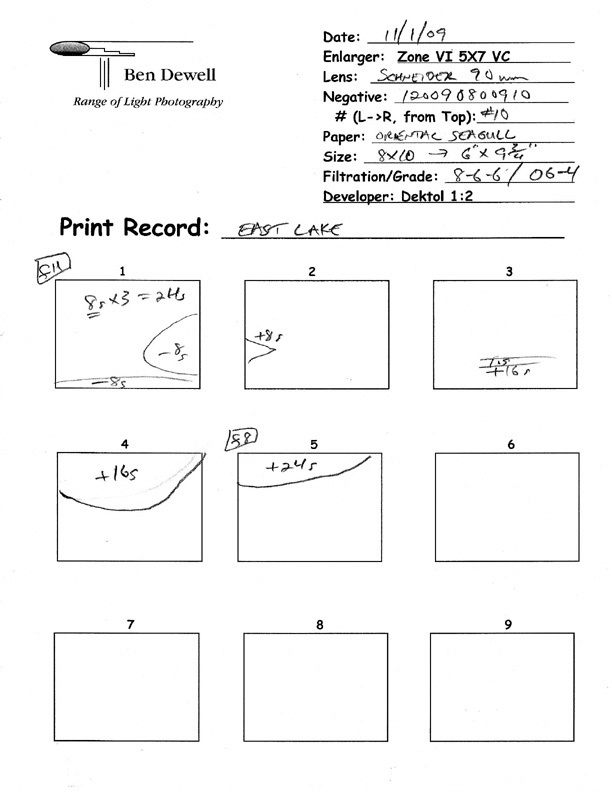 I always use full sheets for every size of sheet paper, even when determining initial exposures. I need to see a range of test exposures over the entire image area to make a proper proof quickly and economically. In my experience, exposure information acquired for the whole print is actually less wasteful than the otherwise conservative method of using half or partial sheets primarily in "important" or key regions. To my way of seeing, all exposures must be seen in context of the entire print area. This is particularly advantageous for landscapes that include a lot of sky since I can usually get a fairly good idea of just how much burning will be required (almost always) to bring out proper sky color and cloud definition. A thoughtfully exposed test print can save many full sheets from wastage in the WORK PRINT stages of of creating a fine print. Determining the correct initial exposure is a simple matter of exposing successive sections of the print under the enlarger with a card large enough to to cover it completely, at a uniform time interval. This first step is identical to Making A Proof. In the beginning, it may take some familiarity with the intensity of the light source to balance the enlarger's lens aperture with intervals sufficient to provide a maximum amount of information to determine which areas of the print should be held back (i.e., dodged) and which need additional exposure (i.e., burned). Incidentally, this is the one time when the card is not kept constantly moving. Simply laying it on top of the easel and moving it between exposures will reveal more and more of the print, resulting in well delineated, easy to read test strips. 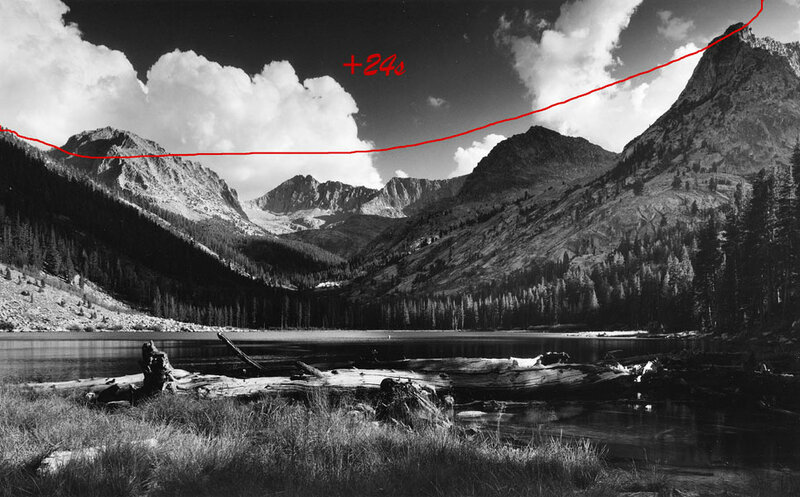 My personal visualization of the scene when I took the picture. The exposure that will result in the least amount of manipulation by dodging and burning. Keeping the "big picture" in mind may serve as a more forthright explanation of why a use full sheets of enlarging paper. The STRAIGHT PRINT (or proof) received 24 seconds total exposure, with the enlarging lens aperture open to f11. From here on in, I use short bursts of light from the enlarger at the same increments (8 seconds) as used in the TEST PRINT. This is indicated in the first box of the PRINTING RECORD as: 8 seconds X 3 = 24 seconds total. Working in incremental bursts of light both facilitates multiple dodging steps and matches more precisely the amount of light delivered to the initial TEST PRINT. Close, but no cigar. In my entire time printmaking, I have only made one fine print from a single base exposure, and that was only for a one or two enlargements, as larger sizes required subtle burning to bring out the same detail in the negative as the smaller prints without burning. 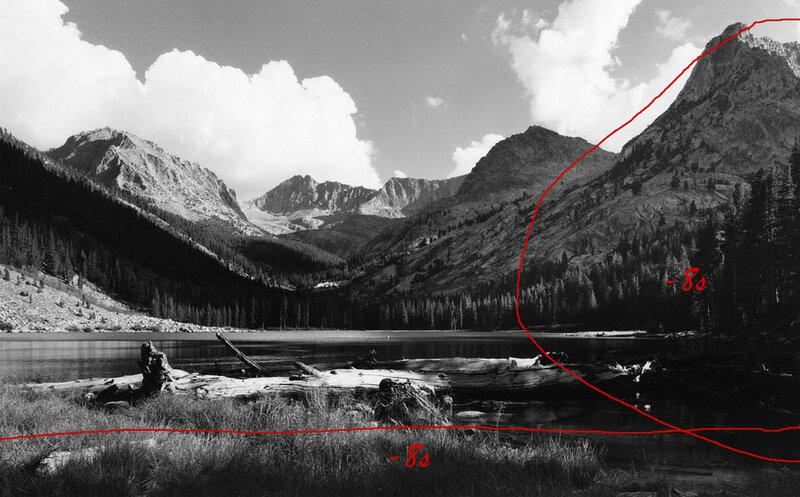 In this case, the right side is in deep shadow and should be held back a bit to resolve the forest and lake outlet. Ditto the foreground grasses. A good TEST PRINT will usually give me a pretty good idea on how to proceed. See the test strip at 16 seconds? Fooled you! DODGING is really the second work print I made. I went back to make the STRAIGHT PRINT just so that you could see the progression. Because I'm working in uniform 8 second increments, I am able to split the regions held back (i.e., dodged) into 3 separate movements (there's that musical double entendre again) totaling 24 seconds. 8 seconds - expose (+8 seconds) the entire print. 8 seconds - dodge (-8 seconds) right side peak, forest, and lake outlet. 8 seconds - dodge (-8 seconds) foreground grasses. 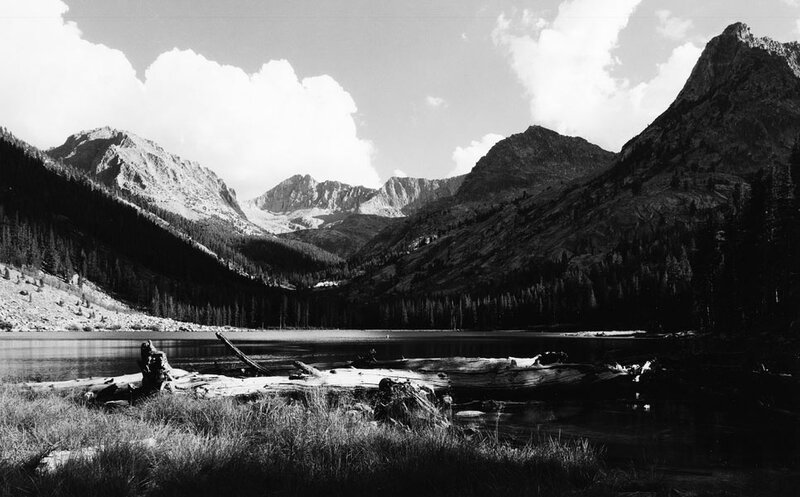 The result is that the entire print received 24 seconds while the right side and foreground received only 16 seconds. Note that the demarcation (the red lines) of dodged areas in the work print is not precise. The card is kept in quick and constant movement some distance from the print (creating the card's penumbra - or partially shaded outer edge shadow), preventing hard lines of exposure from developing, as was necessary in the TEST PRINT. The wedge of forest and talus on the left can be burned down (+8 seconds) to a more pleasing (realistic?) tone. Two burn cards held together in a suitable wedge shape, held above the area to be burned, and kept in constant motion will do the trick. The fallen log at the lake's outlet is too "hot". It can be burned down (+16 seconds) to ameliorate its brightness and to to reveal texture present in what is likely to be one of the denser areas of the negative. This is accomplished by holding two cards covering the entire print, with a narrow ever-changing slit between them to expose only the log. Burn the the clouds to reveal their majestic castellations and the sky to a level of gray which suggests the deep blue color of a clear summer's day in the High Sierra as I visualized it (+24 seconds), keeping the card - guess what - constantly moving. Lather, rinse, repeat. An infinite number of fine art prints can now be made by following the exact same conditions of the PRINTING RECORD (if you are rich!). The finished print may also be found here. My print exposures are recorded in absolute time increments - a specific amount of time in seconds for the stipulated enlarger, lens, aperture, paper, developer, etc. It would perhaps be of more general usefulness to express these times as relative percentages of the base exposure. However, since I normally print several sizes at the time I begin an edition, it is easier for me to translate absolute exposure times into proportionate light values as I progress in size, than to calculate exposure times from percentages. It just fits my peculiar workflow better. Note that in order to conserve space I often combine exposure steps logically in a single box. The first box contains both the initial exposure and the dodges. Also, I have indicated the changed enlarger lens aperture (i.e., opened up) in the final box for the last bit of sky burning. Now that I already know where I am going and how to get there - by following the PRINTING RECORD's recipe - the TEST PRINT can often be skipped when making greater enlargements. 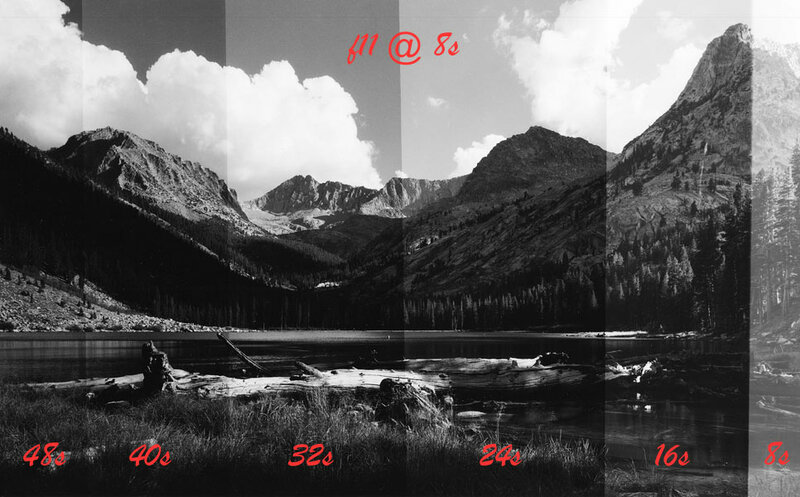 The first exposure for a STRAIGHT PRINT may be estimated by doubling exposure from 11X14 to 16X20, and increasing by 50% from 16X20 to 20X24 - either by increasing the time or opening up the lens - or both. In fact, the STRAIGHT PRINT, and most of the intervening WORK PRINTS may be skipped, as well. Although specific amounts of dodging and burning can change substantially from one print size to another, the total number prints required to arrive at a FINE PRINT may be reduced and much time saved by combining steps before processing the paper. Depending on the complexity of the print, it is possible to make the initial FINE PRINT with only a couple of sheets of paper. Of course all this ease of printing tends to fall apart when printing mural sizes on roll paper. It is often impossible to match sheet sizes with identical roll paper. So I must begin testing paper all over again. Here is the exception that proves the rule about my penchant to use full sheets for the TEST PRINT. I cut only enough paper from the roll to test key areas of the negative, but at least I already now generally what areas of the print will require some degree attention from the last sheet size PRINTING RECORD.